TamCem HCA Plus is a consistence controlling admixture for sprayed concrete meeting the requirements layout in EN 934-5. Unlike other consistence controlling admixtures, TamCem HCA Plus contains Normet’s unique dormant strength enhancing technology to give early age strength boosts to sprayed concrete when accelerated using an alkali-free set accelerator, such as TamShot 100AF. Controllable, long open time for enhanced placement and delivery control. Contains a unique dormant accelerator to boost early strength of accelerated sprayed concrete. Early age strength of sprayed concrete mix. 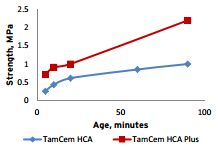 Cem II/A-V, TamShot 100AF, showing improved strength gain when TamCem HCA Plus is used in place of TamCem HCA.